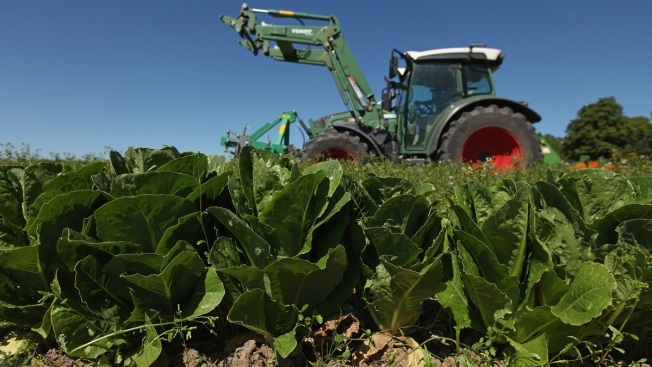 In this June 4, 2011, file photo, farmer Tobias Haack drives a tractor over 100,00 heads of romaine, iceberg and ten other types of lettuce in order to mulch them back into the ground at one of his fields near Hamburg, Germany. In a Nov. 15, 2018 email, James Gorny, a senior science adviser for produce safety at the FDA, wrote that growers “cannot cling to their generic E. coli monitoring standard,” which he called “unacceptable.” The message came five days before the FDA made public another outbreak linked to romaine lettuce, and after a separate outbreak earlier in the year sickened more than 200 and killed five. After repeated food poisoning outbreaks tied to romaine lettuce, a U.S. food safety official shared his concerns in an internal email, saying the produce industry's water testing "failed in an epic and tragic way."